The Premium Biker's Photo Bag from mantona is a safe transport solution for your photo equipment during the next tour with your bicycle. It is, above all, characterized by the globally known quick release coupling system from Klickfix, which can be fastened on the tightly installed plate on the back of the bag. Through its patented tensioning, it is fastened tightly on the handlebar and cannot be twisted.This way you can always keep an eye on your equipment. Once you have found a motif, you can quickly take the camera out of the bag, whereby the cover swings open to the front, to avoid any unnecessary obstruction! 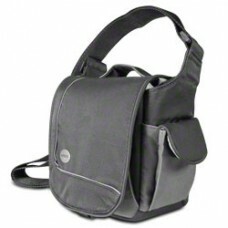 However, with the carrier belt the bag can also be carried on your shoulder. Numerous , well padded inside and outside compartments with lots of stowage space, individual division with Velcro inserts in the main compartment, padded, length adjustable shoulder strap and convenient rain cover.